There are several things you can do to limit exposure to loud noise in both your home and your community. Why is that important? According to the Centers for Disease Control and Prevention (CDC), noise exposure is the second leading cause of hearing loss (aging is first) with nearly 40 million US adults aged 20-69 having hearing damage in one or both ears. Nearly half (53%) of those surveyed reported that their hearing loss was not due to loud noise at work. Researchers concluded that exposure to loud sounds comes from everyday activities in their homes and communities. Ideally, the best means of prevention is to avoid the noisy situation or to use adequate hearing protection, but sometimes that is just not possible because noise is all around us. So what do you do? Turn down the volume of the TV, radio, or music. Take listening breaks when listening to loud music. Reduce equipment noise. Replace worn, loose, or unbalanced machine parts. Keep equipment well lubricated and maintained. Keep children away from loud music or equipment at home. Move or stay far away from the loudest sound-producing source–such as loudspeakers or cannons at college stadiums–especially if attending with children. Limit the length of time of exposure to loud sounds. Pay attention to signs and information flyers warning of possible loud noise and the use of hearing protection. Just remember if you ever need to shout to be heard, then the sound is too loud. Take control of your hearing health, and be proactive about limiting the loud noise around you. 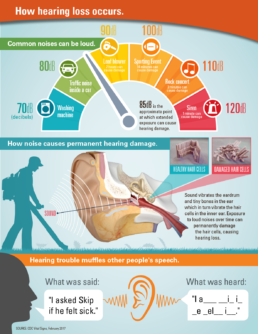 The CDC put together this informative Infographic to show how hearing loss occurs. Basically, sound intensity (loudness) and duration (time) determine at what point noise exposure can cause hearing damage. If you suspect you might have a hearing loss due to noise exposure, please contact us, NHHI, at (603) 792-4327 for a hearing evaluation. You may also make an appointment online.